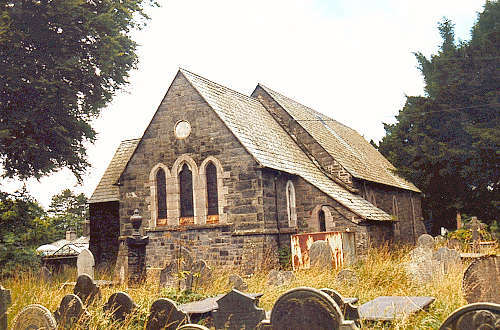 Pentrefoelas was originally part of the parish of Llannefydd. It became a separate parish in November 1810. The church is not recorded as having a dedication. There is evidence of a "chapel" at Pentrefoelas in the sixteenth century. A new building replaced it in 1766, but it was not consecrated until 23 June 1771. T here were additions in 1774. The church was completely rebuilt in 1857/59. For family history information about the church and parish, visit the GENUKI Pentrefoelas page.